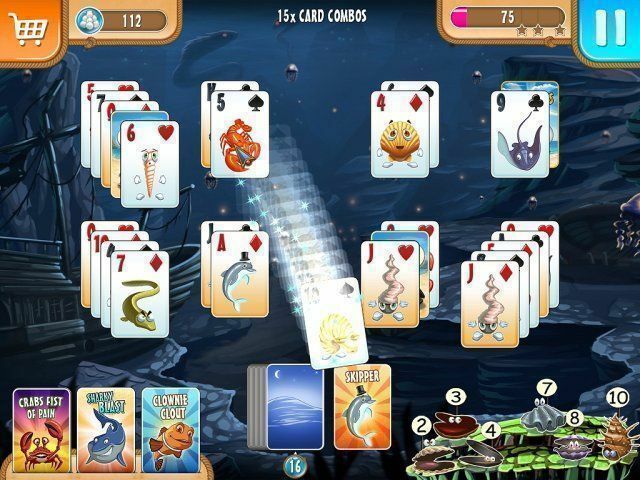 Here you can download the game “Atlantic Quest: Solitaire” on your PC without registration and for free. To download the official version of the game on the computer is very simple, you can do this by clicking the button Download Game. You can get the key to the game “Atlantic Quest: Solitaire” after starting the game by clicking the button Remove the time limit. During the game you don't just turn over cards, but also help our aspiring amateur sleuths getting their fins on the sinister forces behind the accident and put them behind bars. In this brain-twisting solitaire adventure at the bottom of the sea you'll enjoy lovingly detailed comic-style underwater worlds, cool characters and awesome dialogues. Using 10 power up cards, which you can get by trading in valuable pearls, you can show the bad guys what you're made of and push your highscore to new heights. Help Sharky and Clowny in their card battle against the forces of evil!